NEW YORK—Labor activists are calling for Gov. Andrew Cuomo to raise the minimum wage of tipped workers, mainly dining industry servers who earn a $5 minimum wage in New York. 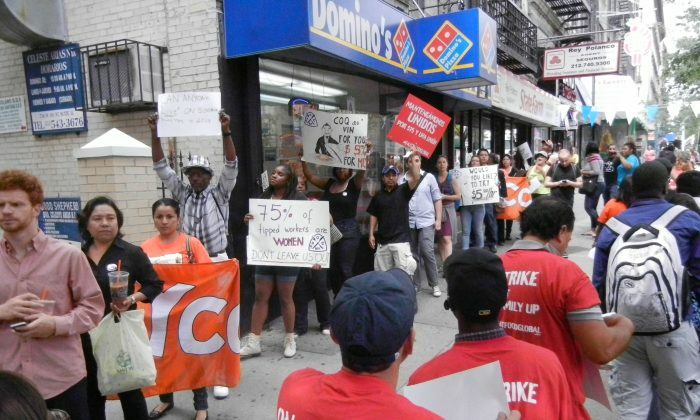 Protestors gathered outside an uptown Manhattan Domino’s Pizza chain store Thursday to rally support for a $9 minimum wage. Autumn Austin, a bartender and server, says that she’s only paid $5 an hour and that tips often fall short of allowing her to make even the regular minimum wage of $8 per hour. New York state law requires employers to make up the difference if tips fall short from the state-mandated minimum wage. But workers say this is rarely enforced. Sonn said that the average tipped worker makes more than the minimum wage, but the uneven distribution means that many routinely make below that. Cuomo signed legislation last year that raised the minimum wage to $9 an hour by 2015, but a clause exempted food service workers. Political gridlock in the state senate deferred the decision to raise the tipped worker minimum wage to a Department of Labor wage board. Sonn said that the wage board has the authority to raise the minimum wage for tipped workers to however high it chooses. Jose Sanchez, a delivery worker who wore a Domino’s Pizza cap at the protest, said that he often makes below the $8 minimum wage after tips, as do many of his co-workers. “It’s our problem, not theirs, they’re not worrying about that,” he said. Twenty-three Domino’s Pizza chains reached a $448,000 settlement with the state of New York in March to reimburse workers who were underpaid. Business associations oppose a wage increase, arguing that it would hurt restaurants. “Most restaurants have raised prices many times over the years—to cover increased rents, skyrocketing food costs, out of control fines levied by government, the Affordable Care Act, paid sick leave, and may other regulatory, operational, and labor expenses,” said Andrew Rigie, executive director of the New York City Hospitality Alliance. “There are limits of how much restaurants can raise prices,” he added. Study finds that 5 or 6 million low-wage workers would be raised out of poverty by raising the minimum wage to $10.10 per hour.